I've lived in the South for a good while. I've lived here long enough to remember when Opryland was a theme park with short lines and a kennel for your dog. Those days are gone now and the once popular amusement park was transformed into an outlet mall and enormous hotel. 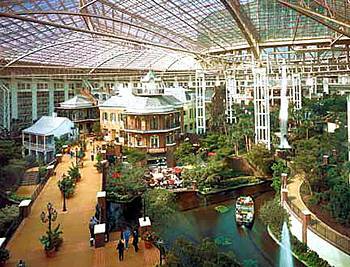 The outlet mall is called Opry Mills and the hotel has become a destination in and of itself. It is a kind of indoor city. In the winter it is filled with ice sculptures and people come from all over to see this enormous indoor wonderland. It is not surprising that a place this big and well known would have its fair share of ghost stories. The most famous ghost in Opryland is known as the black lady. Unlike many of the other Opryland ghosts, she has been seen all over the hotel and even in Opry Mills. She is always dressed in black from head to toe and is said to be a young woman. She wears old clothes that look antebellum in style. She's described as wearing a long black veil that somewhat obscures her face. She is usually seen at night and tends to cling to the dark places. One cleaning crew saw the black lady and were so terrified that they called security. The entire team said they saw the black lady hovering above the floor. Another employee quit after having an encounter with the black lady. Author Christopher Coleman believes the black lady may be the ghost Mrs. McGavock. Her family once owned a glorious mansion and the land around it. That land is now the location of Oprland and Opry Mills. Apparently, the black lady bears a striking resemblance to photographs of Mrs. McGavock and the ghost could be easily linked to the land she once loved. Whoever she is, the black lady still wanders the grounds today, scaring all those who wander the area at night and reminding them that the land is older than what now stands on it. I'm curious as to precisely which Mrs. McGavock she is...I pulled my copy of Coleman's book and he doesn't specify. It is interesting that this family does tie this location with Carnton Plantation in Franklin, which has been deemed, "the most haunted house in Tennessee." I think reading Coleman's entire chapter on this is worth it and I'm glad you did. There is a lot more going on with this ghost than I posted and with other ghosts at Opryland. That's an AWESOME pic of the inside, Jessica. I think I would've liked it back when it was an amusement park too. But the hotel is fabulous. And you shared an equally fabulous ghost story to tell about Opryland! Interesting ghost story! She sounds harmless...just going about her business. Never heard of Opryland before. I love old theme parks! I worked at the Opryland Hotel in 1993. I saw HER. I even smelled her when I took the night's deposit down to the central bank. She smelled like roses. My manager, Aubrey Locke, was escorting me and he smelled the roses, too. Very strange. I stayed there in 2001 with some friends. One night walking down the hall to our room, we felt someone walking behind us, but no one there. Felt like something out of The Shining. Recently looked at some photos taken and there is a white misty area in several of them. I work in office building on the Operyland property. I recently have moved seating location and I have been getting rubbed on shoulder, thigh and was poked in arm tday. I turned around quickly no one. Personally, I have never seen a ghost, so this all seems a bit out there for me. But, I looked up this location because my wife is a fight attendant, and says that she say an old naked man in her room last night at this hotel. She says that she couldn't move so she closed her eyes, and when she opened them he was gone. Be it a dream, or a real experience, I'd say that is pretty damn frightening either way. Has anyone had a similar experience? I have seen her as well as another co-worker at Skechers store in opry Mills mall. She has walked around back of the store and has sat at our benches in store. Just tonight my co-worker told me she was walking down an aisle when the lady stood in front of her and went down another aisle. She had a veil as well as the full black dress. I did not see her, but she woke me at three am a couple nights ago. A woman said “Miss” in my ear while I was sleeping. I refused to look but told her she had to leave.